Theodore Ernest "Ernie" Els is a South African professional golfer, who has been one of the top professional players in the world since the mid-1990s. A former World No. 1, he is known as "The Big Easy" due to his imposing physical stature (he stands 1.91 metres [6 feet, 3 inches]) along with his fluid, seemingly effortless golf swing. Among his numerous victories are three major championships: the U.S. Open in 1994 at the Oakmont Country Club and 1997 at the Congressional Country Club, and The Open Championship in 2002 at Muirfield. Other highlights in Els' career include topping the 2003 and 2004 European Tour Order of Merit (money list), and winning the World Match Play Championship a record seven times. He was the leading career money winner on the European Tour until overtaken by Lee Westwood in 2011, and was the first member of the tour to earn over 25 million Euros from European Tour events. He has held the number one spot in the Official World Golf Rankings and holds the record for weeks ranked in the top ten with over 780. Els was elected to the World Golf Hall of Fame in 2010, on his first time on the ballot, and was inducted in May 2011. Els grew up in South Africa playing rugby, cricket, tennis and golf. At age 13, he won a major tennis tournament, the Eastern Transvaal Junior Championships. But at 14 he made it to scratch as a golfer, and decided to focus on golf. That year he won the Junior World Championship golf tournament in San Diego, Calif., beating Phil Mickelson by several strokes. Els turned pro in 1992, and that year won the South African Open, South African PGA and South African Masters tournaments, something Gary Player had previously done. In 1993, Els got his first win on the European Tour, and in 1994 his first on the U.S. PGA Tour. And that was a big one: the 1994 U.S. Open, which Els claimed by winning a 3-man playoff that lasted 20 holes. Els has enjoyed great success splitting his time between the US and European tours, while also playing in South Africa, Asia and other places around the world. He's won three majors with numerous other close calls. Among the other big tournaments Els has won is the World Match Play Championships. In 1994-96, Els became the first golfer to win the event three straight years. He did it again in 2002-04, becoming the first 6-time champion in that event's illustrious history. In 2004, Els led the European Tour in money while finishing second on the US PGA Tour's money list. Els tore ligaments in his left knee in 2005, and the injury kept him out of golf, and then off form, for quite a while. But in late 2006 he won the South African Open, then late in 2007 he won the World Match Play Championship for the seventh time. When Els won the Honda Classic in early 2008, it was his first victory on the USPGA Tour since 2004. He won twice more in 2010. And late in 2010, by vote on the PGA Tour Ballot, Els was elected to join the World Golf Hall of Fame. 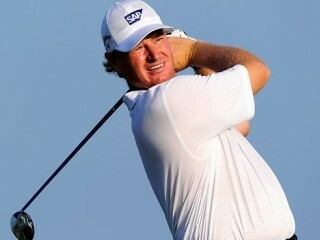 View the full website biography of Ernie Els.